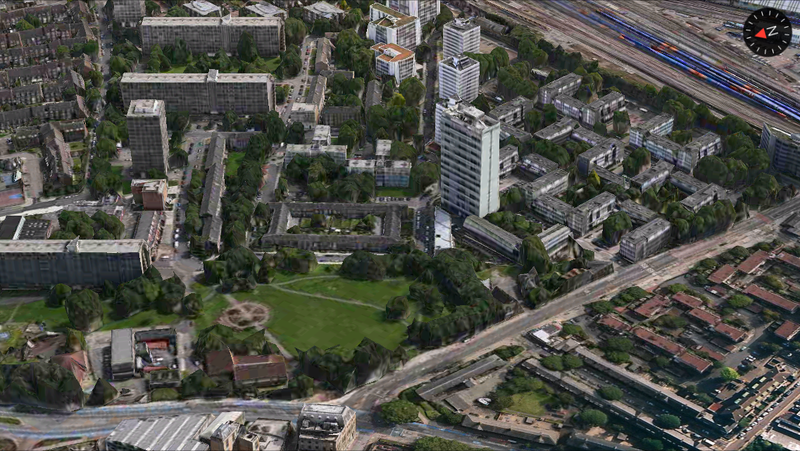 Why was the Winstanley Estate built? 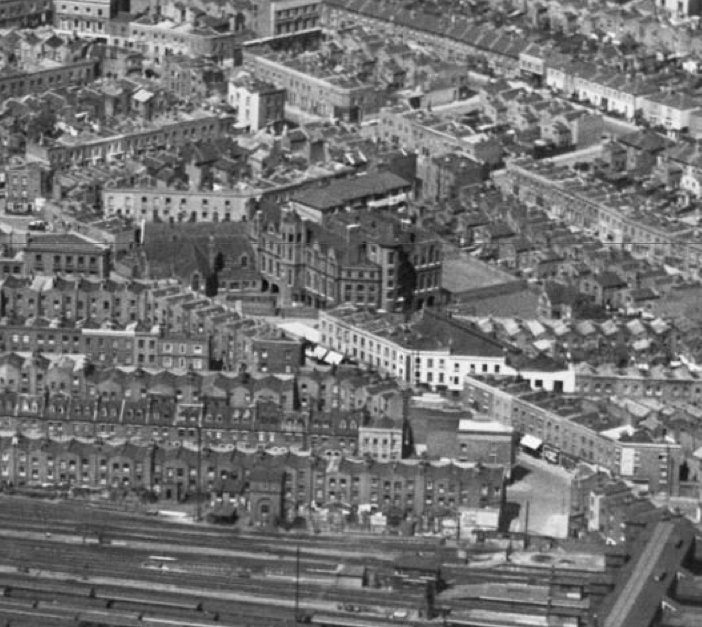 I was excited to find this 1938 ‘Britain from Above‘ photograph – the first time I’ve seen the houses that Winstanley Estate replaced. 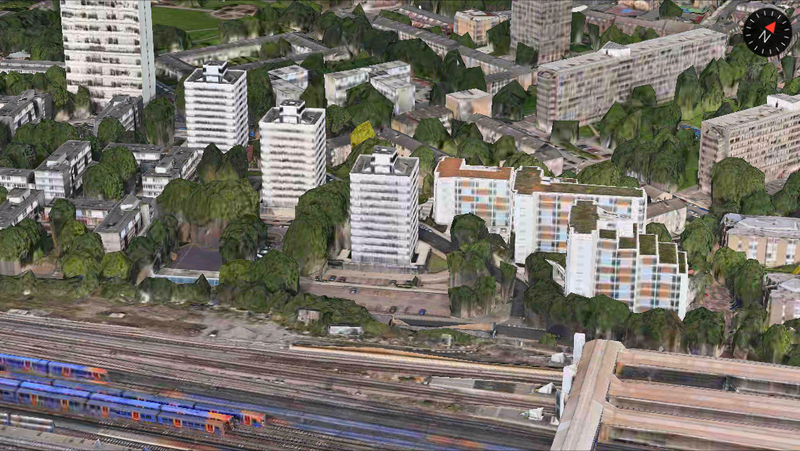 This is how the same Winstanley area looks today – not one building remains from 1938. Wandsworth council recently announced a regeneration plan that will demolish much of the estate over the next decade – including 700 homes built in the 1960s and 1970s. 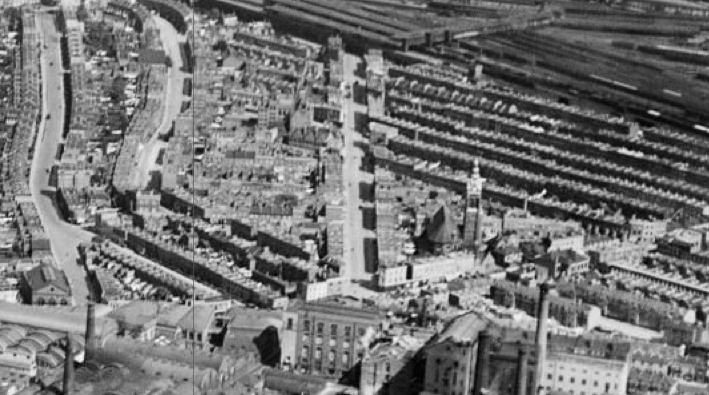 When the above aerial photograph was taken in 1938, the Winstanley area was already earmarked for slum clearance. 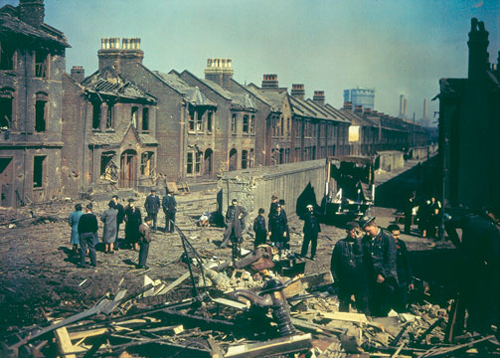 Then wartime bombing shattered thousands of Battersea homes. For more about the history of the area north of Clapham Junction station, read this excellent English Heritage essay. “If you wanted to create something dreary and wretched, it would be difficult to create anything more dreary or more wretched, than Clapham—the Clapham of the Junction and the miles of silly little dirty houses between the Wandsworth Road and Battersea. The pre-estate housing was overcrowded and often a health risk. At a recent Town Hall event I met a local undertaker. He was accustomed to death after a long career but said that a few cases lived with him. One day 50 years ago he was called to a block on Ingrave Street to take away the body of a nine-year-old boy. Conditions were appalling: “I can still remember there was chicken-wire where the windows were supposed to be”. The 1966 film Cathy Come Home has several scenes set in the old housing north of Clapham Junction station. 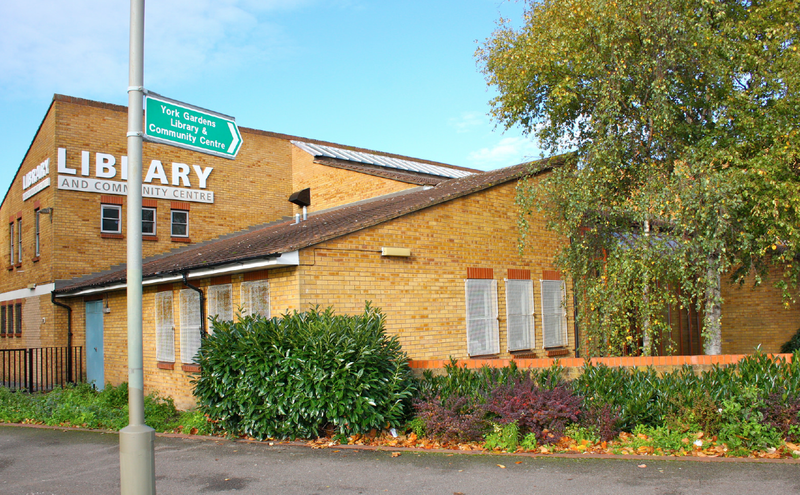 One section focuses on the domestic life of tight-knit Battersea families in Maysoule Road. One irony of post-war ‘slum’ clearance is that the Victorian terraced houses that survive in Little India and Atherton Street can now fetch a million pounds each. 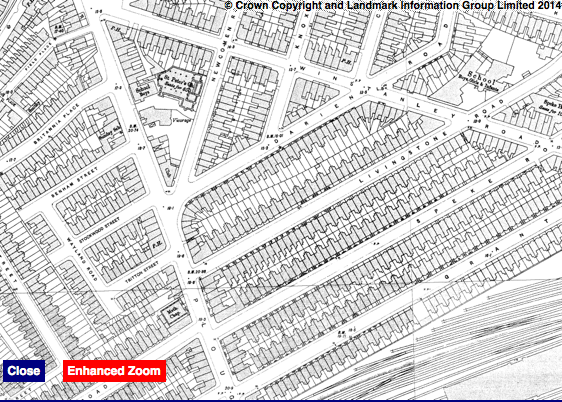 The Old Maps website is the best place to see how the Victorian street-pattern was changed by the new council estate. If you search for Battersea there are maps from 1850, 1874, 1882, 1895 (see below), 1919, 1938, 1948, 1962, 1976 and even a 1985 Russian military map! The Winstanley Estate is often photographed to look dark and forbidding. To help balance matters, I uploaded 60 bright, high-quality images of the estate here for free public use. Dr Aileen Reid, an academic at UCL, produced this video ‘The Winstanley Plays Itself’. It shows how the estate was built and features clips of films shot on the estate, including Up The Junction, Villain and Sitting Target. The Winstanley Plays Itself from London Historian on Vimeo. This entry was posted in Uncategorized and tagged History, Housing, Winstanley Estate by Simon Hogg. Bookmark the permalink. i was born in the Winstanley Arms off licence in 1951. Those little roads and the community was destroyed to build a monstrosity of an estate to be demolished and replaced with little roads and houses it replaced!!!! 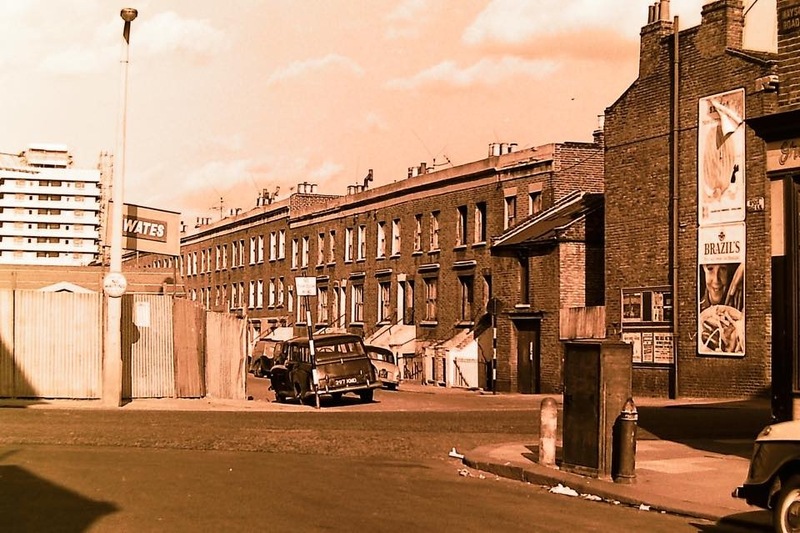 Battersea Girl, by Martin Knight (London Books) is a riveting account of working class life in Battersea during the last century, through the experiences of one family and one woman in particular. 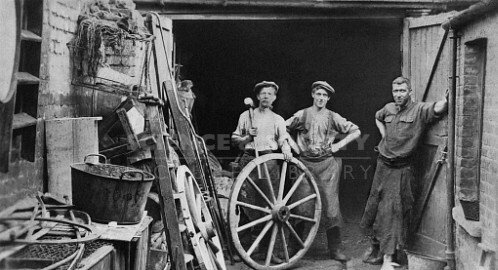 Battersea Girl, by Martin Knight (London Books), is a riveting and edifying account of working class life in Battersea during the last century. Coming late to this but thanks for the great images and analysis. I will be posting a piece on Wandsworth’s post-war council housing next week (19 Jan 2016) and will include a link to this page. Really enjoyed reading your article. I spent my childhood years living in the pre-Winstanley estate area, and still have an elderly relative living on the estate. My view of why the old houses were developed to make way for the new build is multi-factorial but includes the geography of the area. The whole area is damp due to its low lying position and the fact that an underground river – the Falcon brook – runs completely through it. The old houses were owned by landlords who were unable to maintain their property adequately due to the “controlled” low rents the tenants were paying. Many of these homes were occupied by poorly paid workers in multi-tenanted houses which were overcrowded and lacked bathrooms, inside toilets and in many cases proper kitchens. It should also be remembered that the councillor responsible for post war re-building in the borough spent a lengthy period in jail for corruption! I lived in Speke Road from when I was born in 1950 until we were rehoused in 1955. We had 2 rooms in the basement and 2 rooms on the middle floor. A lady lived upstairs. We did have an inside loo but it was shared with upstairs. We ended up living in the 2 middle rooms as the basement was always flooded. There was a scullery and in the outside yard there was an air raid shelter. Only coal fires for heating, or if you were lucky an oil heater. I remember baths in a tin bath in front of the fire. My brother died in 1955 aged 4y and 11m. Because I was always getting very ill by the age of 4 my Dad went to the council in desparation and said he’d lost one child and wasn’t prepared to lose another! He refused to leave until he was promised that we’d be rehoused. We were move eventually to Dresden House, Dagnall Street when it had just been finished. We were at 14 Dresden House when it opened for business. 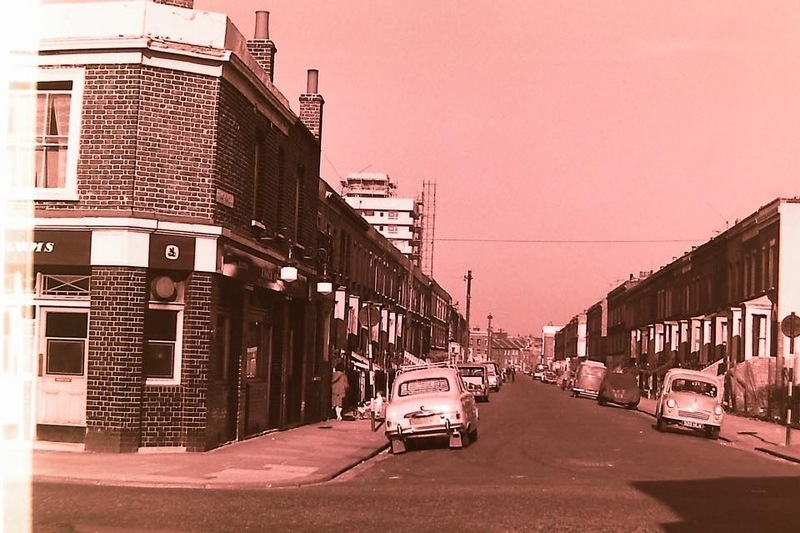 Were on Falcon RD before that where my brother was born in a flat over the Estate Agents next to the Sweet Shop. That flat is now in empty space. The Council did a better job destroying the area than the Germans. out side the cladstone pub that’s ware l had my first pint of mild at1/3p great times great people. BUT the homes were damp outside loo try that in the middle of the night,sunday night was bath night tin bath in front of the fire progressed to plough rd baths ware l had my first SHOWER. Thanks for your memories of Speke Road, a world long gone. Do you remember a family called WEST living at number 79? I am the great grandson of George West who lived at 79 Speke Rd. I found this site while looking for more information about him and his family. His wife was Mary and they had four children Mabel and Maud who died very young, and two sons Sidney and Harold (my grandfather). I believe they moved away in 1945 just as the area was being redeveloped to Camberwell. George died in 1948 and Mary in 1958. I wasn’t born in Battersea but I moved there with my parents and older brother when I was a few weeks old. We lived at 60 Sporle Court for 6 years until we were rehoused with many other families to Wandsworth. I went to Falcon Brook School. I don’t remember a great deal as I was still very young but I do remember playing on the swings and going to the shop underneath our block an buying a whole bag of sweets for 1 old penny. loved going to nobbys and to the sweet shop on estate for penny mixes and played run outs in the pixie huts and playgound under sporle court. who went to the very top of sporle court and played on the roof? we did good fun and getting stuck in the lifts lol! Tracing my family tree and my great, great grandfather (a plasterer) lived here with my great grandfather (worked in the candle factory) and the rest of their family. Great to see where they used to live. The candle factory was called Prices, i think its still there. My grandparents ran the Winstanley Arms pub in the ?late 50s, early 60s. I think the address was 26 Winstanley Road. I’d love to hear from anyone who has stories or photos of the pub from around this time. My Nan and Uncle ran the off licence next door to the pub around the same time. It was on the cornered there was a photo of a black boy standing on the opposite corner on some site on here but I cannot find it now. i remember a bakery opposite . Why include a condescending flippant remark by Eric Gill on pre-war Battersea ? Silly little houses ? It was all that people had to live in. Does anyone know if this was named after Gerrard Winstanley – the social activist during the time of Oliver Cromwell? My great grandfather great grandmother and grandad lived at 18, winstanley road in 1900 when they first got married. My grandparents lived on grant road and were moved into Shaw court. If anyone’s family knew of Alfred Brooks I would love to know more about him. Hi to anyone, my mother & large family lived on Didcot street, her maiden name was Channon.I know that street was pulled down many years ago. My mum was Dorothy(Doll) she had brothers & sisters called Amy, Albert, Kath, Dora, Fred, Enid & Anne. Just wandering if anyone knows where Didcot Street was or knew my mum or family.